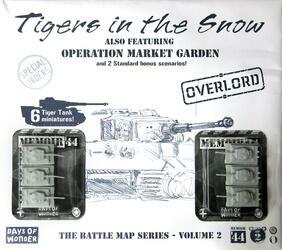 The second volume in the Battle Maps Memoir' 44 series contains 2 Overlord scenarios, six Tiger tank figures and 2 bonus scenarios. After the success of Operation Bagration, the Soviets advanced towards Memel, on the Baltic Sea. This progress soon cut off the lines of communication between the Northern Army Group and what remained of the Central Army Group. By early October 1944, the Soviets had reached the sea, definitively isolating the Northern Army Group by cutting off its retreat. Guderian wanted to evacuate his troops by sea so that they could be redeployed to Central Europe, where the situation kept getting worse, but Hitler stubbornly refused: he therefore ordered the 200,000 soldiers surrounded to retreat into the Curonian Spit, thinking he could use it as a springboard for a future offensive. The Führer did not realize that what he persisted in calling a bridgehead (der Kurland-Brückenkopf) was nothing more than a death trap for his divisions. Despite everything, they resisted six violent assaults before surrendering to Marshal Govorov on May 8, 1945. Most of the prisoners the Russians took that day were sent to Soviet camps, and only a minority returned.